Home»How Do I Know If I Need New Garage Door Springs? For many people, their garage door springs are out of site and out of mind. They trust that their garage door will open and close when they click the button on their garage door opener. Over time, the garage door torsion springs will begin to deteriorate and eventually be unable to lift the garage door. Garage doors have been around a long time, but torsion springs are a more modern concept. Many people don’t notice the warning signs or know that they can get high cycle springs that extend the life of your springs if you use the garage door more than three times a day. Keep reading and discover when your garage door springs need replaced. The torsions springs of your garage door unwind to help lift the heavy door. Over time, these springs can begin to stretch out and not wind as tight. This causes less power to lift the door. When the garage door has trouble lifting or the motor of the garage opener sounds like it’s doing more work than normal, your garage springs might need replaced. Eventually, the springs won’t be able to provide enough power to lift the door. It might go up part ways or it might not go up at all. The motor on the garage door opener wasn’t designed to provide the lift necessary, so without the springs the door won’t open. Nothing lasts forever and after years of opening and closings, hot and cold temperatures and general wear and tear causes the springs to break. The most obvious sign will be the garage door not opening at all. There is no winding and unwinding of a broken spring. When you look at the spring, you’ll notice a clear break. There’s nothing that can be done and the spring must be replaced. Check out this video and learn exactly how to change a garage door spring. There are springs on each side of the door and work in conjunction to open the door. If one side goes up and the other doesn’t or goes up slower, then one of the springs is failing. Don’t let this go unattended as it puts more stress on the remaining spring and could break at any time. This could cause injury or break the garage door. If the door is mostly up with the other spring breaks, then the door can slam down. The impact could damage the door or damage your car if it’s under it. If there is a person under it, then that person can be injured by the door. The best advice is to stop using the garage door once you notice the lopsided opening. Purchase new springs and install them. It’s best to replace both springs because the other is just as worn as the broken one, it just hasn’t stopped working. Instead, change them both and get years of garage door openings without any hassles. Do I Need High Cycle Garage Door Springs? How many times do you open your garage door? If it’s more than three times a day, then you’d be better served high cycle garage door springs. These springs are designed to last longer than traditional spring and made for higher volume openings. It can handle 20,000 cycles and last longer than traditional springs. Don’t worry about your garage door failing anytime soon with high cycle springs. Even if you don’t use your garage door three times a day, the high cycle springs are still a great idea of you want long lasting life for your springs. When the garage door springs begin to wear, the balance between the springs can be off. They aren’t wound the same, so the garage door won’t go up smoothly. This balance will continue to erode and get worse as time goes on. 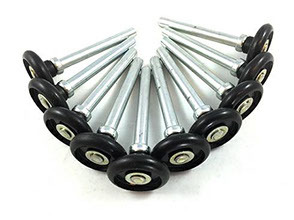 American Overhead Door Parts has everything you need to replace your garage door springs. We’ve have maintenance kits and more. Don’t pay someone to replace your springs when you can do it yourself. Explore our website and get everything you need to change your garage door torsion springs.